Sockeye fishing has been opened on the Babine! Limit is 1 per person. Please read through the notice before fishing! As the current estimate past the Tyee Test fishery has exceeded 800,000 sockeye, the Skeena River recreational sockeye fishery opens in the following areas, with a daily limit of one (1) sockeye. Babine Lake, not including tributaries and excluding those waters within a 400 m radius of the following tributary streams: Morrison Creek, Six Mile Creek,Pierre Creek, Pendleton Creek, Hazelwood Creek, Twain Creek, Tachek Creek, Five Mile Creek, Four Mile Creek, Sockeye Creek, Big Loon Creek, Tsezakwa Creek, Pinkut Creek. Also closed east of a line from Gullwing Creek to the south shore of Babine Lake. Skeena River mainstem waters downstream of CNR Railway bridge at Terrace, B.C. Barbed hooks are allowed in Babine Lake. If you are going fishing for salmon in non-tidal (fresh) waters, you need a Non-Tidal Angling Licence, issued by the Province of British Columbia. Visit the provincial website to buy your licence. Licences are available to B.C. If you drive along Highway 16 you will see a lot of boats heading east for a long winter in storage. Fortunately for those of us that live on or close to the coast, there are still great fishing opportunities for weeks to come. 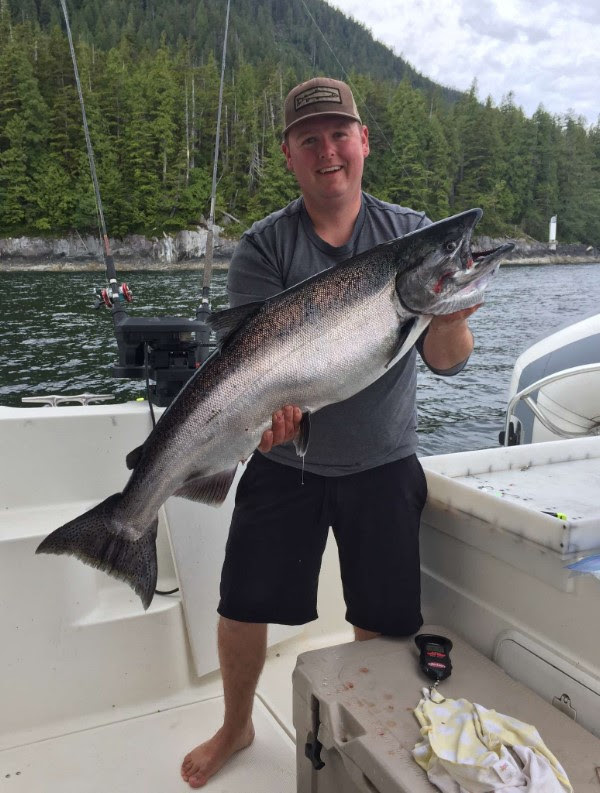 The salmon fishing out of Prince Rupert has slowed a little and like I said last week, many charter operators are hanging up their rods for the year. This doesn’t means there are a lack of fish though. There are still plenty of Coho around with the odd Chinook still being landed. We saw a mid 30's Chinook landed last week and some big Coho as well with the biggest being around 18lbs!!! The bait fish are still plentiful in our waters so when targeting these late season fish, try an anchovy teaser or whole herring rig. There are also a ton of spoons that are available at Oscars that will do the trick. One of my favourite things to do when the Coho are around is to run a bucktail on the surface with light gear. This can be an amazing amount of fun with these scrappy fish. Out of Kitimat, the Coho run is heading down the channel in full force. We are seeing nice bright fish being caught from open water all the way to the mouth of the Kitimat River. I prefer an anchovy or needlefish spoon when targeting these Douglas Channel fish so anything in the 3-4 inch range should be productive. The ground fishing has been good and steady over the past week. Anglers are having to pick their days as the weather has limited their ability to get to the outside but most people are still finding fish. The Crabbing and prawning remain good. Head down to Oscars when you’re planning your next fishing trip and let their crew get you into the gear that will help you be successful on the water. Water level is good, a bit higher than last year at this time. The recent rains made the water a touch murky but still looking great! Pinks, Coho, and a few Steelhead are in. Try fishing Coho around Trout Creek or Moricetown. Reminder: As of September 1st it is mandatory on many rivers to purchase a Steelhead Stamp and Classified Waters to your licence. River is in good shape. Tons of Pinks in the system and some Steelhead and Coho are starting to show up as well. Please be advised that there is a grizzly bear living near Date Creek who has stolen people’s fish and charged people. Be Bear Aware! You don’t want an encounter with this animal. River was hit with a lot of water yesterday and was quite dirty today. But it has already come down a lot throughout the day. Coho are in. Copper River is blown out which is making the Skeena pretty dirty below that. It is still fishable. Coho are being caught around Ferry Island and a few Steelhead are being hooked into. Sockeye fishing has been opened, subject to limitations. Please read notice from the DFO in the 'lakes' section.